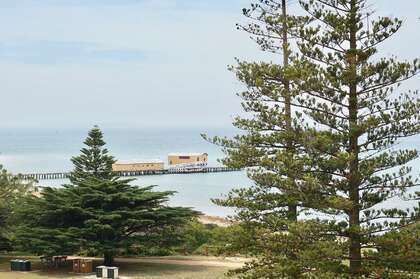 Queenscliff & Point Lonsdale (“Lonnie”) are located along the spectacular Bellarine Peninsula, only 1.5 hrs from Melbourne. Whether you’re after a short getaway, a family holiday or needing somewhere to stay for an event or special occasion, we are sure to have just the pick for you! Our huge return guest rate is a sure testimony that Queenscliff & Lonnie offer a welcoming small town feel coupled with the creature comforts that we all love, not to mention the breathtaking surrounds! There is something for everyone in our beautiful region and what a better way to explore, than book a comfortable home away from home. We invite you to browse through our large range of homes. Availability calendars are current and instant tariff computation will ensure your tariff reflects the length of your stay. Add properties to your shortlist for further consideration or if you find the perfect match, place an online request – we will give you a courtesy call after receiving your booking and answer any queries you may have. If you need assistance in making a choice you are welcome to discuss your specific requirements with one of our friendly consultants. Stay in May and get a complimentary 12 noon check in and 12 noon check out. This offer is not available if we have a back to back booking. Go to our Specials page to see which properties are offering you a special 15% discount to stay in June. This special is not available with any other special offers. Stay in June at the Stunning Clydesville for 3 nights and only pay for 2 nights! Speak with one of our friendly consultants now. This special offer is not available in conjunction with the June 15% discount offer. Beautiful house with personality. Felt very relaxed and comfortable, the house is in a great location close to all amenities, no need to drive anywhere! 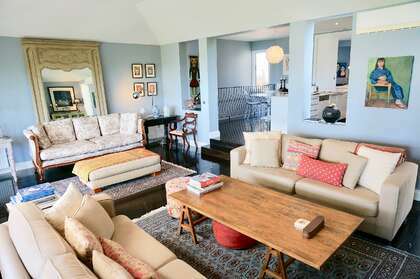 We would definitely recommend Bayview House as a great weekend getaway. Carolyn. Fantastic position in the centre of Queenscliff. This is a very large apartment with wonderful views in several directions. The best accommodation we have ever had for a holiday. beautiful property great for families, spacious. Loved the log gas fire, could stare at that all night. Fantastic outdoor area!! Centrally located, stylishly presented, an interesting and memorable place to stay. Very well equipped kitchen with everything you need, comfortable bedding, 2 king size beds. TVs in every bedroom and Foxtel in the lounge area. Does not feel like a holiday home furnishings are classy and luxurious. A real treat! Stunning property, which is beautifully laid out and decorated. Plenty of rooms and living spaces. Highly recommend. Perfect Location, Clean and Comfortable. Charbella is in a quiet area, well appointed with all you would need. The beds are comfortable with quality mattress and pillow protectors. A lovely property that is private, quiet yet very close to the street and all amenities. We thought Bayview Hideaway was in a great position and very stylishly decorated with good amenities, maybe needed a few side tables for the lounge. The couches were very comfortable also. Had a great time. The house is fantastic for groups or families, plenty of room for all ages to have their own space! A beautiful well appointed apartment in a sympathetically restored and renovated hotel. The ozone tower has everything you need; 4 bedrooms, generous lounge and dining area, great views from the tower, deck and front rooms. Well-appointed, large, in a terrific location. Photos do not do it justice! Very Modern with great beds. Very modern, linen was clean new and fresh. Beds were great to sleep on. We would definitely highly recommend this property and hope to stay again. The apartment was fabulous and we appreciated all the comforts. It was very clean, beautifully appointed. Position right in the centre of town yet wonderful sea views from lounge and balcony. A most enjoyable place to rent, can't recommend it too highly, simply the best! We had a marvellous break and enjoyed to the full our stay at Chevignon. We will certainly stay there again. 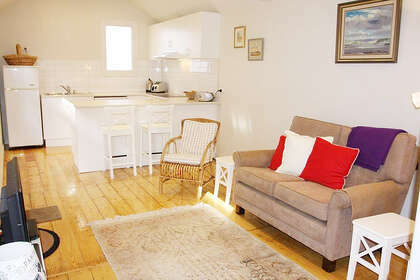 The location is great, walk to the town centre for a coffee or to the beach. great location, house was fabulous, one of the beds was not sturdy enough for our 16 year old. Wonderful, far bigger than expected ! Wonderful, far bigger than expected and very comfortable. Hydronic heating was a good surprise. It would be perfect for a couple of families to share. Beautiful old home with large,modern kitchen living area. 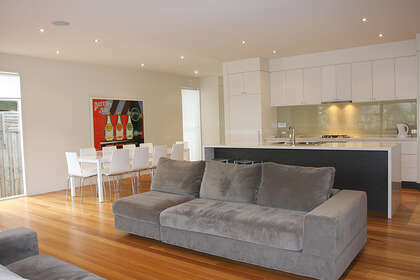 First class property - recently renovated to a very high standard. Foxtel for the teenagers or a rainy day was terrific. We had no difficulty at all with the Wifi. The property was spotless upon arrival. You will definitely a stay at this property. Great Position close to town, lovely traditional family holiday feel to the whole house. HOUSE HAD PLENTY OF SPACE FOR THE FAMILY GROUP AND ALSO AREAS TO HIDE AWAY FOR SOME QUIET TIME. Great service from your friendly office staff. Location terrific for the property - suited our needs perfectly. Stella on Stevens was close to perfection the most private and comfortable place we have stayed in. Thank you for letting us stay in your beautiful home, we had a very enjoyable family weekend. The amenities were fantastic, sizes of rooms were amazing, will definitely be staying at the" Stone House" again. Chevignon exceeded our expectations because it was much better than the pictures on the website. The property was well furnished, spacious, clean and had everything we needed. The kitchen and backyard were our favourite places. Its location to Queenscliff and surrounding areas was also excellent. Generously equipped, clean presentation, great position and a good view, but still quiet. We were very happy with the accommodation. 3 minutes to the Beach, short walk to town, plenty to see and do, with lots of room to relax as well! Great family house with a convenient layout and location. 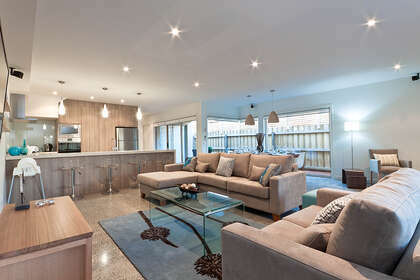 We loved staying at Sea Pup which is a modern, spacious home conveniently located to our favourite beach and close to sports amenities and the main street. We have already booked for 2017! A gorgeous house! We loved the moona tree and the front veranda. Well equipped, both inside and out.For our small family plus friends visiting, it was just ideal. Kitchen and Laundry facilities were excellent. As were the 2 deck areas. This property is spacious and beautifully decorated throughout. The location is so central and convenient to everything including shopping restaurants and the beach. No need to use your car. The kitchen especially is very well equipped. Great location, as we like to be close to shopping and eateries. Bay View House is'comfort plus' from lovely comfortable beds and pillows, to the fluffy towels and extra linen if needed by guests. Fabulous 'gourment kitchen' with everything you require, if cooking meals while on holidays!!!! This house is a credit to it's owners and very kind they are happy to share it with other guests, this we did appreciate. A magnificent home that delivered everything the pictures suggest -luxurious beds, comfy couches, plenty of towels, a superb pool and a well appointed kitchen. This is a beautiful place to stay. Had a wonderful stay at Chevignon. The house is very comfortable and has everything you need for a getaway. Lovely backyard and outdoor area that I hope to enjoy more on another stay in warmer weather. This house was amazing to stay at over the weekend. It was perfect for a romantic getaway and the heated pool topped it off. It is very close to the main street and there is a restaurant that does breakfast and lunch right next door which the food tasted amazing. Plus there is a restaurant/pub which is walking distance. A great stay in a great house over the long weekend. 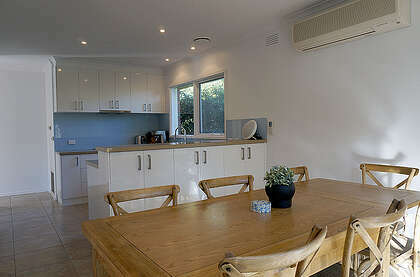 The collection of keys and team at Queenscliff & Coastal Holiday Bookings made the process seamless. The house was well appointed, generously comfortable, quiet and clean; while positioned in an excellent location for easy access to both beach and town. Augmented by a lovely grassed backgarden with great shade for people and dogs, secured with both fences and lockable gates of a good height to keep those four-legged family members safe. Everyone felt relaxed and at home within minutes. A great place for a relaxing holiday. The location of Into Freedom is fabulous - a short walk to town and the beach. 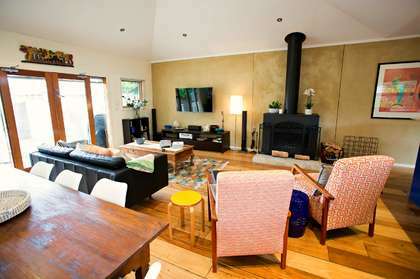 The house is very welcoming, roomy and comfortably appointed, with heaps of seating for a large family or a group of friends. We loved that we could bring our dogs and the air conditioning was appreciated. We've already booked for next year and highly recommend Into Freedom. 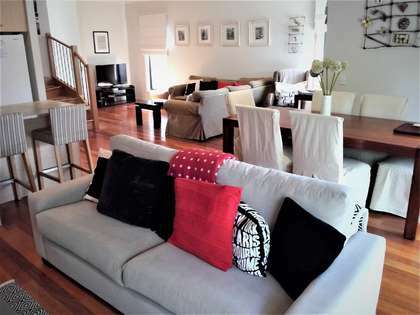 This is an absolutely fabulous house - very modern with a lovely fresh decor and in a great location. Fantastic backyard and sporting equipment. Excellent for multiple families. We loved staying at Chevignon! The house is beautiful, well furnished and equipped. We used the log fire quite a lot, which made things super cosy. The beds are all very comfortable, and there is plenty of space for a family to relax in. 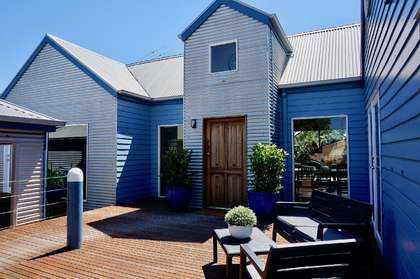 I would definitely book this property again if I was coming to Queenscliff. We had a really relaxing break, and i simply couldn't fault it. Highly recommended! Great house in a private setting. 2 families stayed comfortably. The house was very close to Santa Casa beach, very big backyard and nice modern kitchen and bathroom. Clean, easy to use and well equipped. This is an extremely comfortable house on a beautiful street. The house is big enough for two families/couples to enjoy privacy and well-equipped shared spaces. An easy short walk brings you to the township and the front beach in one direction and the other magnificent beach in the other. The linen provided for a fee was generous and of a good quality. Dealing with the Queenscliff & Coastal team was a pleasure. Easy walking distance to the main street. Loved the combustion fire place. The house had a lovely warm and friendly feel. A last minute booking for us. What a peaceful lovely property....loved the garden. Ideal for us as we had our dog with us. Very comfortable. Hope we can visit again. Nice and clean, great location. Would definitely book it again. 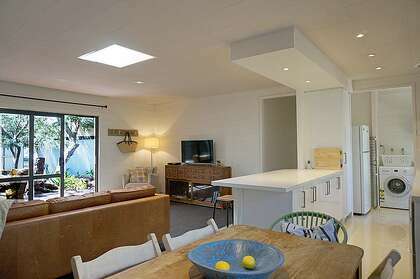 Loved our stay.....in this bright,light filled holiday home so close to the main street and beach. 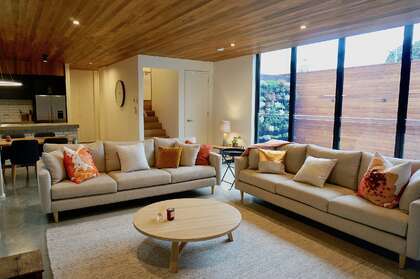 The main living area with its high ceilings and large,light filled windows make the room much bigger than it appears on these website photo. This is a great, comfortable, quiet property for 3 couples or 2 couples with 2 kids. 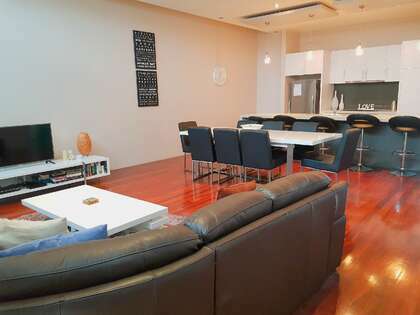 The two separate living areas are terrific and the kitchen is very well-equipped. Decor modern and the house was spotless. Easy walk to beach and about a 15 minute walk to the QMF venues. Would book again. We really enjoyed out stay at The Dune House. 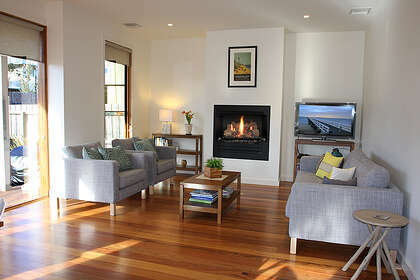 The layout of the property was perfect for our families and the fire place added a wonderful warmly feel. Access to the beach was quick and easy which made walking along the beach very enjoyable. We would definitely book through this business. Lovely huge luxurious apartment - truly unique - we had a fabulous time. The property is very well equipped, like a home away from home. 5 min walk to beach, 15 min walk to shops. large enough to accomodate a family of 4 and extended relatives . What a beautiful home. It has a fantastic location to the Main Street, beach and local cafes and restaurants. Easily accomodated 8 adults, fantastic size bedrooms and living areas. Great family home and great value. Perfect for a family holiday. A very comfortable & beautifully presented house. It more than met the needs of our three children/partners & their children. 10 altogether. Close to parkland, children's play area, beach & Main Street. The front lawn area was great for playing cricket. Wonderful view to bay. Excellent location with coffee shops, chip shop, local store and art galleries at your door step. The main beach was a hop, skip + a jump away with incredible views + a dog friendly / off lead beach was a short 20 minute stroll down the road. The house is beautiful with a well equipped kitchen including everything you need to cook up a storm. The spa is perfect for relaxing post bbq feast and the house is also stocked full of games for rainy afternoons. We loved our stay with a few mates and would highly recommend this place. Great property, presented very well. 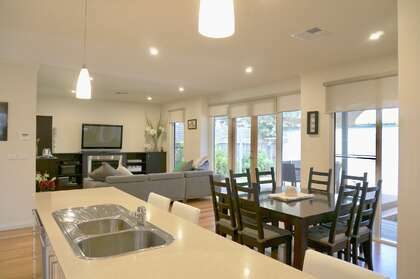 The property is very well designed, fitted out well and a delight to stay in. Excellent Location - Just perfect! Everything we required was available. 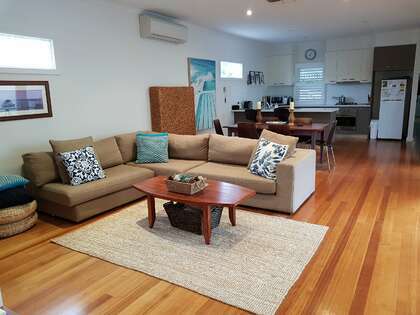 Excellent location to beach & rock pools, parks, walking tracks, coffee shops, supermarket. . . just perfect! House a wonderful place to entertain and for family gatherings. Home was nicely furnished, warm, comfortable, great position to beach and town. What a beautiful place to experience Queenscliff! Gorgeous decor, relaxed vibe, everything you need to enjoy your stay. It was super easy to cook in the amazing kitchen, and plenty of room for everybody to share the living areas... the reading nook was especially popular. Bringing our dogs was the icing on the cake - and they particularly enjoyed being a walk away from Dog Beach! Everything we wished for & more. Beach Haven was everything we wished for and more. The house has every amenity to make your stay an absolute pleasure. Spotless, spacious and comfortable. The proximity to the shops and beach is a huge draw card. We highly recommend staying at Beach Haven and we definitely will be back. Close to town centre and walking distance to the beach. Very comfortable place to stay would definitely recommend it! The three of us (two adults and small doggie) found this property to be perfect for our needs. The house was spacious with modern amenities, good heating and cooling and an enclosed yard for our little doggie. We appreciated the lock up garage and easy access to the property. We would certainly like to stay at Lonsdale Shores again. 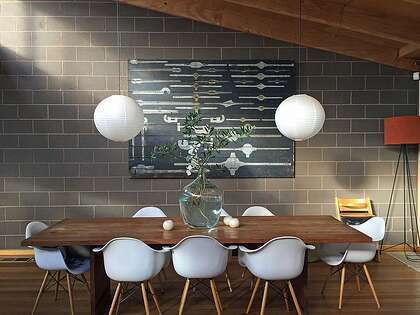 Modern décor, very clean, beautiful sun streaming through the windows. Gorgeous views. Short walk to dog beach. We loved it and cannot wait to return. We loved watching the trains go past. Lovely house close to the beach, very comfortable and clean. New kitchen and bathrooms. This is a very nice house that accommodated a large group well. Lots of extra little things. Very comfortable house, lots of extra little things, good range of crockery, bowls, baking dishes etc not often provide. Amaroo is such a lovely house to stay in. It was immaculate when we arrived and it has all of the modern conveniences you need. We had a lovely holiday with our little pugs and we will definitely be back again. Really enjoyed the privacy. Very well stocked with amenities. Beach Haven was outstanding in all areas. It provided us with all the facilities we needed to celebrate a very special birthday in our family. 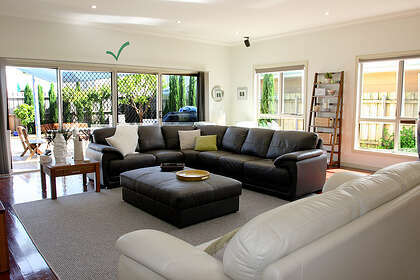 It was extremely spacious and catered for many living areas so that everyone felt comfortable and relaxed. Proximity to the beach and shops were a real feature of the house. Service provided by the Queenscliff and Coastal Holiday girls was outstanding and made our stay wonderful. We would love to stay at this property again. This house was very well appointed, well located and very clean and comfortable. Staff were very courteous and professional. The property was well presented, clean and welcoming. Thank you. Well equipped, clean and comfortable house in a great location. Would definitely stay there again. There was plenty of room for all of us. Close to all in Queenscliff. We would book this house again. We thought that the linen should be included. Very spacious and relaxing property. This is easily the best holiday rental I have ever stayed in. The house is beautifully designed. We arrived on an over 40 degree day and I was slightly nervous about the lack of air conditioning. However, once the house was opened up, it cooled down quickly. There was everything you could possibly need and enough spaces for people to find a bit of privacy if needed. I would highly recommend this house and would love to back every year. 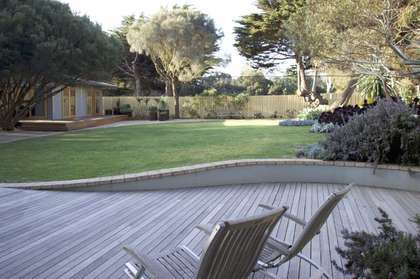 Close to the beach and easy riding or walking distances to both Point Lonsdale and Queenscliff. Beautiful!!!!!! Very comfortable, clean and cozy accommodation for our family of three and our dog. Amenities available were great as was the location. Have already started planning our next stay there! We loved our stay at Shortlands. We stayed for a week and were in Queenscliff for a family wedding. It was very comfortable and had fabulous amenities for 5 adults. The kitchen, dining, living room was wonderful. It was so well set out with plenty of room for cooking, while still part of all the interaction with our family. We look forward to returning and staying again at Shortlands. Beautiful Apartment & Stunning spot. 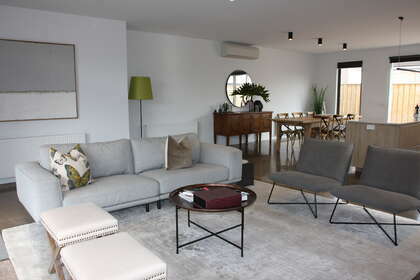 Ozone Tower has 'spoilt' us for future bookings, it is a beautiful apartment and stunning spot. Beautiful property, extremely well equipped and furnished. Very comfortable bed and bedding. Lovely position in town. Perfect place to have a getaway with a group of friends! Very comfortable, great kitchen and living area. We had the most wonderful & enjoyable stay at The Dune House. Such a gorgeous place, proximity to the beach, pet friendly, & beautiful comfortable beds.We will definitely return and hopefully soon!Was very hard to leave. A beautiful, very well equipped house. The beds were comfortable and the house immaculate. As a group of 5 women, we stayed 3 night very comfortably. Great Views, Beautiful House, Great team. 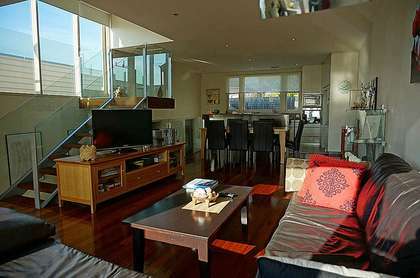 Beautiful pet-friendly property with great views. The team were so lovely and professional at all times, and were happy to answer any questions. Great home, very comfortable, well equipped. Large living area was great for our family holiday. Bathroom in the back shed was handy too. Nice private outdoor area off the living area was good for extra space too. House was beautiful and comfy.Had a great view of the sunrise. Felt very relaxing. We really enjoyed our stay. The property was really very comfortable and it worked out really well for our dog. It was our first time travelling with our dog !!! 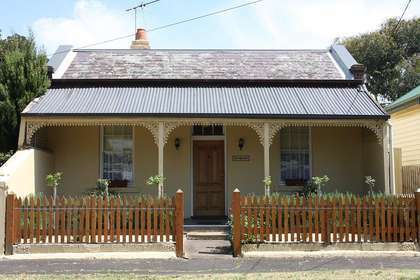 Clydesville is a beautiful, historic property fantastically located in Queenscliff. It would suit any number of holiday makers from a family, to couples or a very indulgent girls weekend. 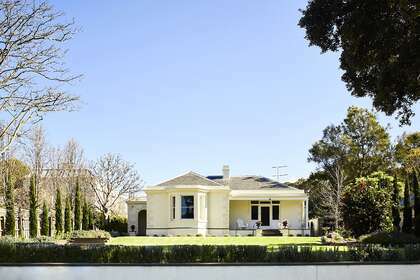 I highly recommend this property and the gorgeous little hamlet of Queenscliff as a destination!! Thanks for having us. Another fabulous property. Close to everything. it is a fantastic property with easily the best dog proof fence we have ever stayed in. Loved it. 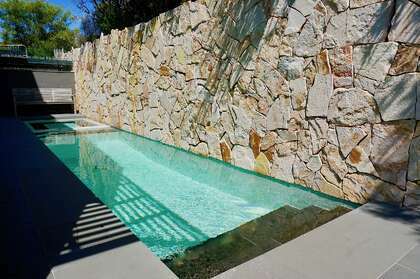 This is a fantastic property - very luxurious and with a fabulous location. The staff at Queenscliff Coastal Holidays were amazingly helpful. 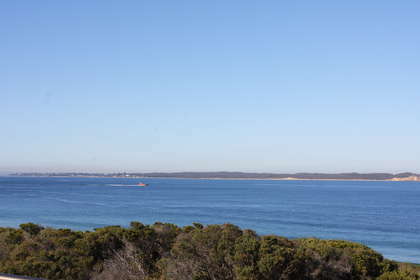 A short walk through the dunes to the dog beach and an easy beachside walk to the Point Lonsdale shops and cafes. Stunning house. Our second stay, and we'll be back. Nice cosy cottage in convenient but quiet location. 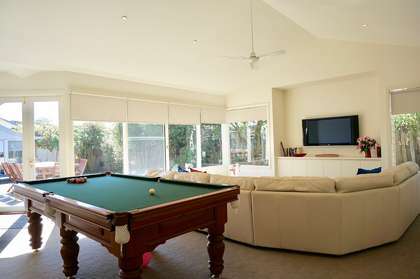 Very comfortable property with excellent facilities and location. The quality of the furnishings and bed and linen was first class. Lovely house to stay in and excellent customer service from the Queenscliff and Coastal team. I would highly recommend booking with them. 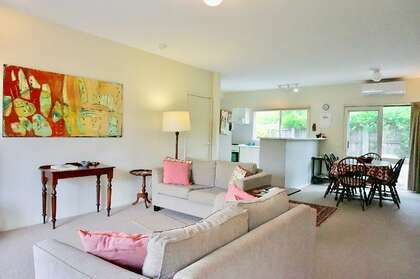 Well appointed and close to beaches, walks and town. Great property and realestate agent. Would highly recommend. A fab place for the family who likes to holiday with their four legged friends.. great spot, great garden..
Don't forget your favourite book to curl up in the tower for an afternoon read in the sun. 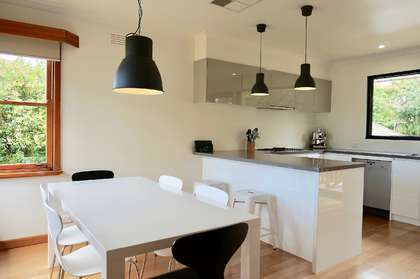 Perfect proximity to main st for cafes bars etc or use the well equipped kitchen to cook for yourself. We really enjoyed our stay,. We really enjoyed our stay at Chevignon. It is a beautiful home that has nearly everything required for a relaxing long weekend. Very well appointed with regard to kitchen appliances and homewares. Appreciated Netflix. Good garden for pets. Family room, movie room, deck & front yard and the decor/art works. The showers are not the best but other than that everything was great. Excellent property! Loved our stay! There were 7 Adults and 2 little boys 2 and 4mths old, had so much space which made our stay so enjoyable. very well equipped property. Extremely comfortable, spacious and wonderful having the 3 bathrooms. We had the most amazing stay at this property for our wedding. 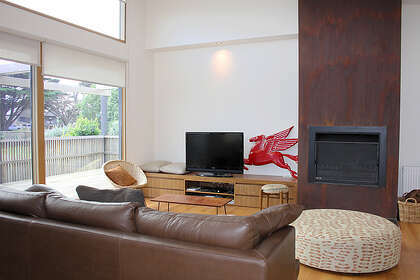 The house is incredibly styled and the QCHB team who take the bookings are so accommodating. Everything about this stay was perfect. Lovely property.Would definitely stay again. Great house with lovely view. Very clean, would stay here again. Ozone Tower was a sensational property that provided us and our family and friends a wonderful experience for a beach holiday. Extremely comfortable and unbelievably spacious. Fantastic accommodation. Can't think of a thing, everything was there that we could have wished for. Perfect position, perfect weekend, the home exceeded our expectations, very comfortable and a great place for 2 families to share with a dog. thank you for sharing your home with us. Into Freedom is a lovely spacious home, nice walk into town and great coffee and food spot just up the road. The view is just beautiful, the kitchen well stocked with pots,pans and crockery. The beds comfy all made on arrival. The lift a wonderful creation allowed everything to go up in the one hit. The library down the road has an excellent choice of DVDs if you don’t like what is on offer at the tower. very inviting property and clean would recommend a stay thanks again. The Stone House was amazing in everything it offered. Heaps of living space. Within walking distance from both the shops and beach. The House offered all this and so much more. It was a truly relaxing holiday. Grand property, with sea views, close to shops and beach, very relaxing, would recommend to others. Charbella was a great tidy little property well located walking distance to everything. QCHB very easy to deal with, highly recommended. Property really had the 'wow' factor. Close to everything and restful. I was pleased with 62 Hesse St. being so close to the township but out of the way enough to be quiet. Great location, close to main street and local attractions, just park the car and explore the town on foot. 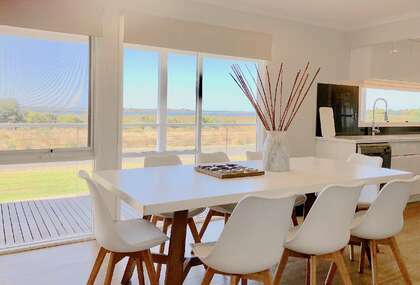 Fantastic views, lovely modern beach house with heaps for all the family to do in any weather. We will be back. The house and everything about it was fantastic. It gave us everything we needed. newly renovated, clean and great location. Highly recommend. Handy location and walk dist good for dog .loved décor ,well stocked. Lots of options, lots of beds, lots of fun! Beachcomber was such a lovely property. It had everything we needed, was extremely comfortable, and was perfect for our family of four. The location was great for bike-riding. We would definitely recommend the property and would happily stay there again. Thank you for allowing us to stay there. Fantastic space with excellent views. This is a wonderful property that has the "wow" factor and more! It is in a perfect location and the views are fantastic. It is one of the best equipped holiday properties we have ever stayed in ( and we have stayed in many here and overseas) and has the most comfortable beds. The apartment is incredibly spacious with the added bonus of its own tower from which the wonderful views can be enjoyed from the comfy day beds. This is a perfect place for a special occassion holiday and is amazing value for the price. Unfortunately we had to leave after a week but will certainly return! Beautiful property, immaculately kept, luxurious stay. This property was just as beautiful as the photos depicted. We loved our stay. It was close enough to walk to town and the beach was extremely close. Amazing property. Had a fantastic stay. Beautiful relaxed environment to get together with family and friends. 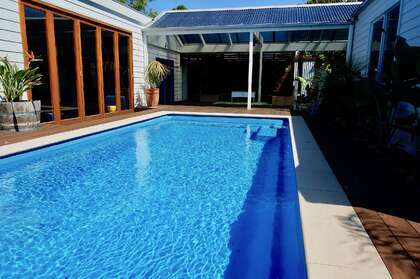 This is a comfortable and spacious home, with excellent outdoor areas, landscaping and pool. Very suitable for groups. Perfect location for lovely strolls in the town centre or on the beach. Beautiful house only a few meters from a stunning beach and cafes. The kitchen has everything you are looking for. Very clean, comfy beds and dog friendly. everything else was perfect. Watching the ships go in and out of The Heads during the day and at night was a highlight as well as the nearby beach which i thought was one of the best in the area for swimming, walking and relaxing. To get the amazing views, the elevation of the house required some flights of steps which we found enhanced our fitness. Great house for a family. 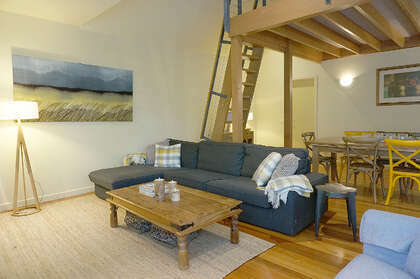 4 adult couples stayed and had a lovely relaxing time great amenities well fitted out. The kids had fun in the cubby house. The house was even better in person than in the photos! Great deal. I would highly recommend Queenscliff and Coastal Holidays. The girls in the office are so lovely and they make the booking process and my stay so easy. We had a problem with the washing machine and they called someone in to fix it the next day! Such fantastic service and the house we stayed in is amazing. 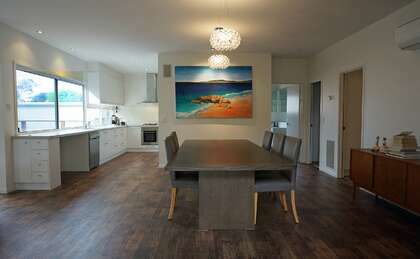 This is a newly refurbished holiday home. It is very family friendly with a great front yard for kids to play in. We enjoyed our stay here. Beautiful Apartment with great views. 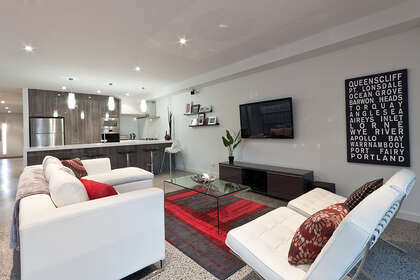 The apartment was fitted out beautifully in a very modern style. 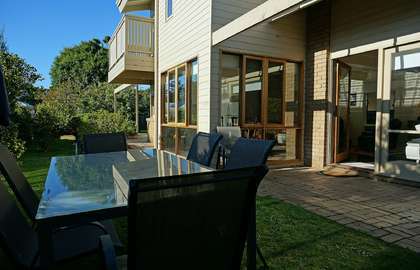 Close to restaurants, views to the beach, bay and wharf where excellent and the park across the road is lovely. Great location in a low matainence house that easily accommodated a family of 6. Would stay here again. 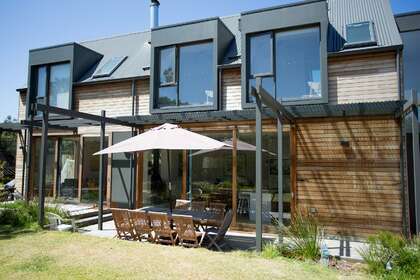 The property exceeded our expectations and was perfect for a weekend in Queenscliff. It was a perfect location being close to the beach and to town! Excellent value for money. Very well appointed with everything you need for a great weekend. We really enjoyed spending the week at Stella. The kids loved the pool and it was a great property to relax at. 4th year in a row enjoying this property! Beautiful house - more like a 5 star hotel. Only down side was all the construction noise going on at The Point - but a small price to pay for such a beautiful rental. We didn’t want to leave and will definitely be back!!! Fantastic large living area with generous, comfy seating. Kitchen is well set up, quality laundry appliances, comfortable beds. Staff extremely helpful and obliging. Very well appointed house. Perfect for a few families sharing. Lots of things to play with and no need to bring anything from home for the kids to play with. Great kitchen dining area. Fabulous outdoor area with so many seating options. Great location - walking distance to the shops and beach. Excellent family option. Very clean and well appointed. This has been our second stay and we loved it just as much as our first stay last year!! A fabulous holiday house for larger families. Very clean, comfortable and spacious. Well appointed kitchen. Highly recommended. Excellent house with all modern convenience. Excellent property and Great booking service. Very functional and comfortable . This is an outstanding property. It's off the main shopping strip with a fabulous outlook over parkland to the water, but no more than a 500 metre walk to most of the restaurants and shops. 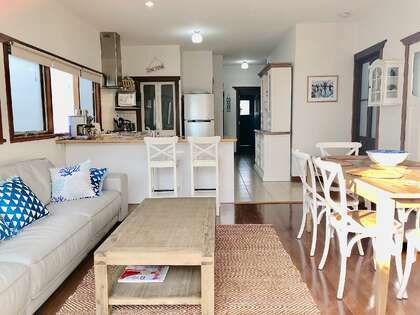 The 5 metre ceilings, timber floors and a really well-equipped kitchen make this a delightful place to stay in an area that shows Queenscliff at its very best. This is the third time I have stayed. Great house and location, perfect for a girls weekend away. Thanks lovely Chevignon, we'll be back! Chevignon is a very comfortable, well set up home with lots of natural light and a high degree of aesthetic quality to enjoy even while on holidays. The owner has obviously created a holiday home with many personal touches, including ample games and books, kitchen equipment, plus creative pieces and decor objects pleasant to the eye. The space and layout is fantastic. The position is great...an easy walk to beautiful beaches, parks and shops. Perfect for those of us who like to walk not drive on our holidays. 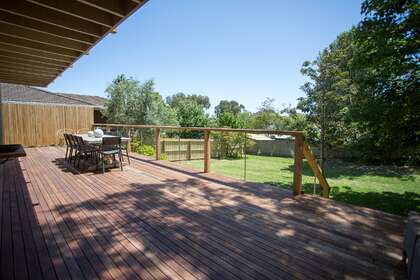 Cosy property, beautiful deck with gorgeous natural garden. This was such a cozy, comfy and beautiful home ! It is only a one minute walk from the centre of town. Lovely experience ! Well located, very quiet and very clean. A delightful stay. it was a very good stay we had and would like to stay again. Fantastic location! Clean, spacious, very comfortable home. Excellent holiday home near the beach and the town. This is our third visit to the little area where this house is - we love to visit! Great floorplan/layout this property, we loved it. Great for cooking and socialising all in one space, always being part of the action. This property had everything we needed. Great position and lovely, welcoming home. We loved this house, it was clean and very comfortable with lovely French provincial decor. Even better in real life! It had a great amount of space and areas to relax in. We were 3 families with 5 children and never felt like we were on top of each other. With the beach, a playground and a cafe all within 5 minutes walking distance, it really is in a perfect location. We can't wait to come and stay again. 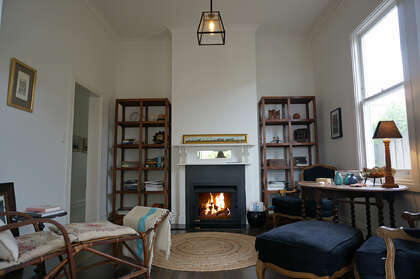 The house was perfect for our Queenscliff stay. It had all the mod-cons, nothing was spared. The bedrooms were well appointed and very comfortable. The best thing was the proximity to the town centre and the water. It was just a 2 minute walk. This makes a huge difference, as you don't need to drive when going out for dinner. The kids loved playing the Wii! There was a good selection of board games as well. Foxtel movies included! Awesome for late nights after a few drinks. I would stay here again, and would definitely recommend it to others. Great location and despite its small size, was an easy property to live and entertain in. Secure for pets and children. A sea glimpse from the upstairs decks was an added feature. 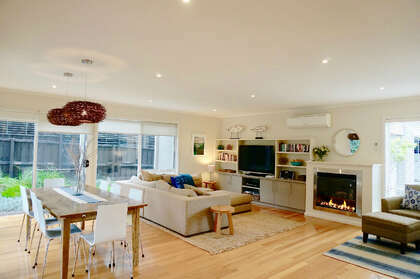 A short stroll to the main street, front beach and park and a quiet location made this an ideal family holiday house. Highly recommended. A delightful weekend at Chevignon. We had a delightful weekend at Chevignon. The house was spacious, spotlessly clean and very stylishly decorated. The kitchen was very well equipped with high quality appliances and cookware. The house's best features include the sunny deck, large claw footed bath, very comfortable queen sized bed and a cosy reading nook. We didn't want to leave, and we will be sure to come back soon. We have stayed here a number of times and thoroughly enjoy it. By chance stayed at this lovely home for 8 nights. The property is dog friendly with a good secure yard to the rear. The house was comfortable,and the kitchen well stocked with crockery etc. A good spot for walking to town or beach...the "dog friendly" beach is only a few minutes away. Would certainly recommend. A great part of Old Lonsdale. Loved staying at Glan Mor. Really suited our needs. Really lovely property with excellent proximity to the beach and town. We would definitely stay at Salt Spray again. Very relaxing venue with great amenity. A lovely, comfortable house with a beautiful garden. Absolutely gorgeous property!! Stunningly decorated, great layout and a very warm and relaxing environment. The perfect backdrop for our pre-wedding photos. The property was clean, very comfortable and impressive. We loved it so much we booked it again. Amazing place. Great place, comfortable, close to everything. Position Perfect - a wonderful stay. Had a wonderful stay. Extremely cosy & comfortable. Position was perfect. Close to all amenities. Beautiful modern home, which was a great space for two families staying. Great and convenient location, and good amenities. Beautiful kitchen and outdoor entertaining area. We loved our stay! 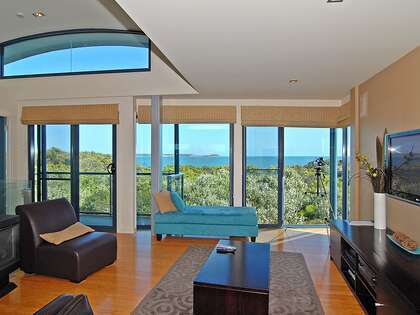 It is easy to stay in and has plenty of light, great views and fantastic sunrises and sunsets. On our stay in winter 2016 the owners supplied Foxtel and access to wifi, which was wonderful as my daughter was studying for her year 12 exams so could google for information. It rained most of the time so it was great to be able to watch movies especially in the evening. The house is dog friendly so our 4 year cavoodle had a great holiday too. We loved the big porch and great table, really good looking BBQ; would have loved to spend more time out on it but unfortunately it rained most of the time we were there. Great location close to beach and shops. Space for parents and kids to have their own space/TV. A really nice open, light, comfortable living space. Well equipped kitchen. A great outdoor area. All makes for a relaxed holiday. In the heart of town with a lovely sea view from the balcony - a rare find in Queenscliff. Generously appointed - just turn up don't bring a thing. This was an excellent property for weekend away and exactly as described online. Bedrooms were great and beds really comfortable. 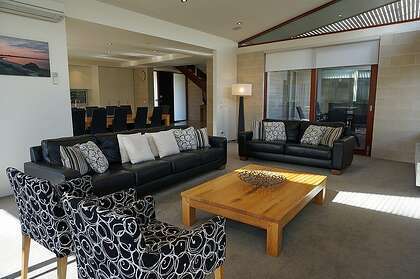 Living areas at the rear was excellent as felt separate to the sleeping areas at the front of the house. Great location, very central and we walked everywhere. Would definitely stay again. Our stay was great and the property was beautiful. Great layout for large groups. Only issue during the stay was the Foxtel not working. Its in a great location for beach, shops and walks and is very well appointed, which makes for comfortable and relaxed holidaying. We enjoyed the space in this house. The kitchen provided ample utilities, especially the coffee machine that made a good cup of coffee.